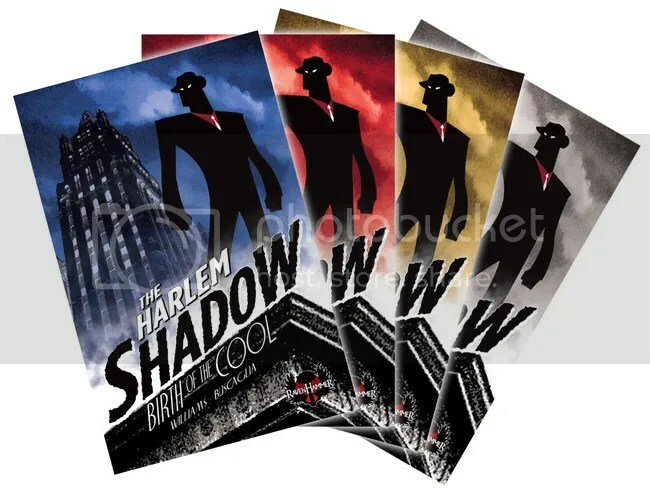 Born at the tail end of the Harlem Renaissance, The Harlem Shadow is the first official Black paranormal crime-fighter that hit the streets of New York around 1929-1930. He was known for his scary appearance, his vicious hand to hand combat skills and his mastery of two lethal revolvers, used to maim and disarm his enemies but never kill. In 1950 as a result of the Black Mask Act…Harlem Shadow was hunted down by New York City Police, lynch mob style, and unmasked. His name was Linden Somerset, a school teacher and librarian, and he served a twenty year jail sentence at Alcatraz Island. This is his story. I picked up this comic awhile ago, and it seems like a good time to review it, considering the big news that the character is now being developed as an animated web series by Russell Simmons, with rapper/actor Common set to provide the voice. The issue, published by Ravenhammer Comics, features a 10-page story, written by Brian Williams and drawn by Rodolfo Buscaglia, detailing the Harlem Shadow’s debut as a crimefighter. Set in 1930, it’s late at night in Harlem, and a Black reporter named Nigel is out with a beautiful woman who turns out to be the girlfriend of a notorious local crime lord, referred to as Boss Man. As the women leads Nigel into an alley, where he’s about to be beaten and killed by three of Boss Man’s armed enforcers, as punishment for a series of articles Nigel’s been writing in the newspaper about Boss Man’s crimes, the nameless figure in a trenchcoat and domino mask, who has been watching the entire events unfold, leaps to Nigel’s defense. The masked man is a skilled martial artist, and is able to dodge bullets, but is also armed with his own guns, which he doesn’t hesitate to use. After rescuing Nigel, he makes a deal with him. He’ll protect Nigel, in exchange for Nigel continuing to write about crime but to also write about the vigilante and his exploits, to help him build a reputation of fear amongst the criminal underworld. He also tells Nigel to come up with a name for him, and it’s Nigel who coins “The Harlem Shadow”. You can buy this book for your Kindle or iPad on Amazon, or if you you don’t have one of those you can download a pdf at comicfleamarket.com, which also offers a printed copy, for you luddites who still like reading comics printed on dead trees.